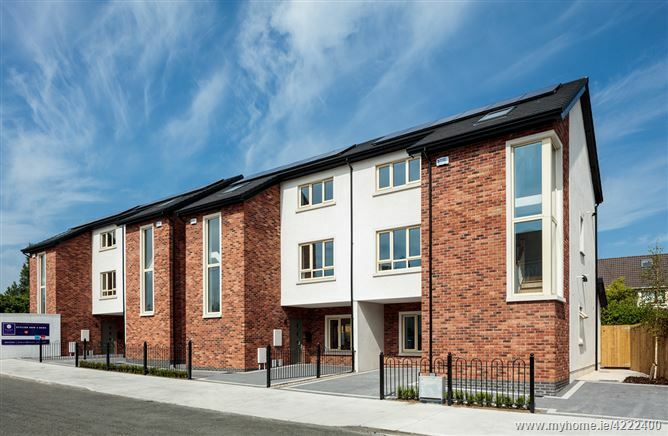 Tandy Court is an exclusive development of just five stylish new 3 bedroom homes, conveniently located in the heart of old Lucan. These new homes feature a modern open-plan design, with high levels of energy efficiency and a luxurious finish. The development is located in close proximity to Lucan village centre, and benefits from a host of amenities and transport links. Viewings by appointment only, please contact Lisney New Homes by email tandycourt@lisney.com or via phone 01 638 2700 to arrange a viewing. Branded integrated appliances to kitchen, including, fridge freezer, oven, induction hob, extractor fan, microwave and dishwasher. To find Tandy Court, take Junction 4 off the N4 onto R120 continue straight into Old Lucan Village, at the traffic lights adjacent to Courtney's Pub take a left towards AIB. Continue straight on R835, take a left just after Ball Alley House onto Tandy's Lane. The new homes at Tandy Court are straight ahead on your right.